Ana had two relationships with seemingly opposite personality types. Her husband of many years revealed a controlling nature early on, but as you all know, divorce is not the first thing you think of doing when things are not going well in your marriage, especially once children come, and especially if your culture and belief system dictate otherwise. Ana found herself trapped in an unbearable prison where she remained until she eventually found the strength and conviction to leave. Once freed, she reconnected with a former love whose personality appeared to be the antithesis of her ex-husband’s. She was blissfully happy for a time, until the day his hands forced the breath and life out of her body. My Sweet Encounter with Death is a memoir of domestic abuse. The first husband was coercive, abusive and manipulated the courts against her regarding child custody. The second husband exploited her financially and in the end tried to poison her and then finish her off when it didn’t completely work, after she asked for a divorce (for the life insurance). When she called the police and tried to get a restraining order no one believed her and she was briefly hospitalized. A nurse suggested she get a hair sample tested for poison and it came back positive for barium poisoning. This was awhile after the incident and he left the country. It’s a fantastic sounding story but I have actually heard several similar stories involving spouses lying to the courts to restrict custody for the other spouse, mistreatment by law enforcement and courts not recognizing the disorder, forced hospitalization, and even poisoning! 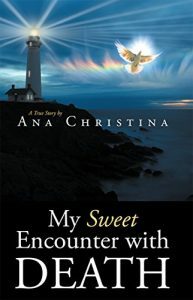 When Ana Christina was being suffocated she experienced Jesus foretelling, preparing her, and being with her as she briefly lost life and had a near death experience. This is perhaps my favorite memoir of this genre because of who Ana was. She came out of a happy secure childhood to become a mature, educated, and highly successful woman. She gave all she had to her work and relationships, to her faith. It was her abundance of gifts that drew two exploitive men into Ana’s life, and her optimistic, trusting nature that made her blind to intentions. It was only after the fact she was able to understand the vulnerabilities that, in looking for love, allowed her to be exploited. In spite of the extreme destructiveness of her experience (including appalling mistreatment by the legal system), Ana’s humility, honesty, and faith transformed her horrific experience into the greatest healing experience of her life. Written from the perspective of her lifelong Christian faith, Ana adds a spiritual dimension to her point of view. This can easily translate into whatever spiritual bent you may have and add another layer to your healing. This amazing story of strength, truth, and victory will without doubt resonate with your own experience, perhaps give you greater clarity, and hopefully inspire you along your own difficult path.